The course opens with a good birdie opportunity on a long par 5 that doglegs to the right. A well struck tee shot down the middle or left will give you the best opportunity to reach the green in two, but you won’t be able to see the green on your second shot. Hitting a 3 wood or hybrid down the middle of the fairway will be your only chance to hit this green in two; or at worst, it will leave you with a short pitch to a green that slopes back-to-front. The second hole is fairly short with a water hazard on the right of the fairway that isn’t visible from the tee box. A well-hit tee shot must veer to the left of the small tree in the distance to stay on dry land. Take an extra club on your approach shot to this elevated two-tier green. This hole is definitely tougher than it looks. On one of the only holes on the course that moves right-to-left, make sure you don’t try and cut the corner on this hole. Hit your tee shot up the right side to avoid the fairway bunkers, then take an extra club on your second shot as it almost always plays into the wind. Your approach shot requires particularly precise control as this is one of the shortest greens. One of the hardest holes on the course, this long par 3 requires a great tee shot to reach the green. Watch out for the waste area to the left and back of the green. A shot just short of the green leaves a fairly easy chip for your second hit, but don’t worry if you need an extra shot; par is a very good score on this hole. Hole 5 is the last par 5 on the front nine and the #1 handicap hole. A dogleg right, long hitters can try to carry the fairway bunkers, but this shot will only stay in the fairway if hit left-to-right. The smart shot is short and left of the fairway bunkers, leaving an easy lay-up. Your third shot will mostly likely be a short iron or wedge to a fairly flat green in the back, which is deceptively sloped back-to-front. The sixth hole is a hard left-to-right dogleg that requires an accurate tee shot toward the barber pole in order to avoid an extremely lengthy second shot. Long hitters can hit a straight drive directly over the bunkers. Take at least one extra club for your second shot, as any miss to the left will land you in a very deep greenside bunker. A drivable par 4 for long hitters, Hole 7 requires a left-to-right drive over the right fairway bunkers. Most players go for a tee shot directly over the pot bunker in the middle of the fairway, leaving a short to mid-iron into a crowned green. Take note of the pin location as long putts on this green are especially challenging. The only short par 3 on the course, the eighth hole features a two-tiered green that makes it particularly difficult to hold the upper tier. A short- to mid-iron to the middle of the green and a two-putt for par is a reasonable score here as this specific hole doesn’t yield many birdies, in spite of its modest length. Wrapping up the front nine, a well-placed tee shot down the middle-left side will give you the best angle into this green. Any tee shot veering right will land you in deep rough or trees. If you happen to hit it beyond the fairway bunker, take an extra club into the elevated green that slopes back-to-front. On this short dogleg left, long hitters can try to cut the corner, but most of the time, the reward isn’t worth the risk. The smart play is to hit your tee shot just short of the fairway bunker, leaving you with a short- to mid-iron into a two-tier green. Take an extra club on your approach shot to combat wind interference. If the pin is cut all the way in back, fight the urge to fly your ball all the way to the hole. Instead, hit your second shot to the middle of the green and putt two for par. This relatively short par 4 can be difficult when the wind is blowing. The eleventh hole will test your true ability to hit a solid tee shot. Give it all you’ve got with a shot just right of the fairway bunker as this hole always plays into the wind. Take an extra club on your approach shot to the right-to-left sloping green. This left-to-right dogleg features the added challenge of wind at your back, so you can attempt to cut the corner over the fairway bunkers. Most players will hit their drive just left of the fairway bunkers, leaving a mid- to long-iron into a severely back-to-front sloping green. Landing to the right of the green will leave you with a nearly impossible up-and-down. This hole is a good birdie opportunity as long as your approach shot stays below the hole. Hole 13 presents another long par 3 that plays directly into the wind. Take a long iron or hybrid and aim for the middle of the green. Don’t think of a par score here as settling on this difficult hole, especially if the pin is cut in the back of the green. Make sure not to land your shot to the right of the green as you will be left with another extremely difficult up-and-down lie. The fourteenth hole offers a fantastic scoring opportunity as it almost always plays downwind. Hit a solid drive down the middle or up the right side of the fairway. If you go for the green in two, hit your second shot with one or two fewer clubs than you normally would as this green is below the fairway and plays downwind. Keep the pin location in mind, because if it’s cut in the back of the green, you should avoid hitting directly at the pin as there is a deep pot bunker to the right of the green that can’t be seen from the fairway. Arguably the most difficult hole on the course, this long par 4 with a left-to-right dogleg plays directly into the wind. Hit your best drive up the middle or to the left side of the fairway. If your second shot comes up short, pitch your ball close and be content with par. Beware of the bunker just right of the fairway that can be difficult to see from the tee box. Hole 16 is a dogleg right-to-left. Long hitters can try cutting the corner on this hole; the secret is hitting your tee shot just left of the fairway bunkers, toward the small opening that will leave you with a short iron into the green. The smart play is to hit your tee shot just short of the fairway bunkers, leaving a mid- to long-iron into the green. You can’t see from the fairway, but the back half of the green slopes severely from left to right. Par is a very good score here. The seventeenth hole presents another tough par 4 that plays into a right-to-left crosswind. Note the pin placement—if the pin is cut back left, you’ll need to hit your tee shot high and to the right and settle for a two-putt par. If the pin is cut middle or front, you’ll have a good birdie opportunity, especially if you leave your tee shot below the hole as this green has a steep back-to-front slope. Another dogleg right, this is great way to finish as this final hole tends to yield many birdies and eagles. Long hitters can take it right over the top of the fairway bunkers on the right, leaving a mid- to long-iron into the green. If you prefer to play conservatively, be sure to hit your tee shot just left of the fairway bunkers. After a mid- to long-iron lay-up, you will be left with a short iron or wedge into a green with a severe back-to-front sloping green. A putt below the hole is a must for a good chance at birdie on this finishing hole. Cancellations will be accepted up to 24 hours prior to your tee time. There will be a charge of $20 for each no show and short show in your party, so please call in advance if your group size changes. Designed in 1987 by seasoned golf architect Robert Muir Graves, a long-standing member of the American Society of Golf Course Architects, Santa Clara Golf & Tennis Club is just a short drive from most of the Bay Area’s major cities. This fun and challenging 6,722-yard course is one of the only public golf courses in the area that offers a full 18-hole championship layout with a full-service bar and restaurant, seven lighted tennis courts, and extensive practice facilities. Open from sunrise to 9pm, our practice facilities include a lighted and covered driving range with 33 stalls, a sprawling putting green, a chipping green, and a practice bunker. Santa Clara Golf & Tennis Club has everything you need for an exceptional golf experience. 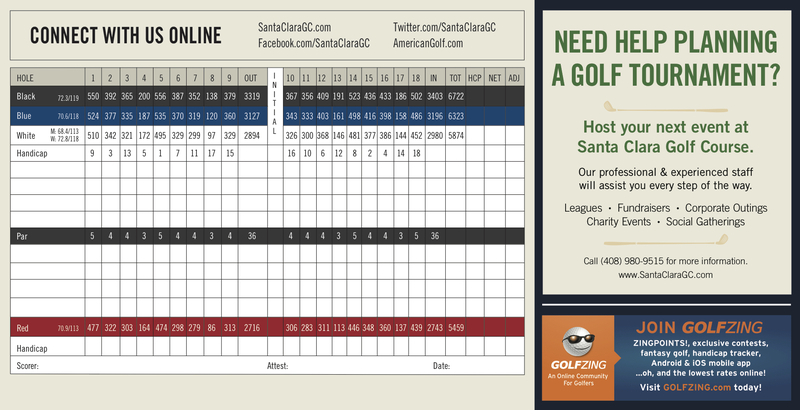 To book a tee time call (408) 980-9515 or click here.